Last week, we reached a huge milestone in expanding our Pangian Remote Network – Pangian Accounts! Part of our mission at Pangian is to connect top talent with high-quality remote work and global employers around the world. Our new user accounts are designed to alleviate your job-hunting process while keeping you in control. Not sure why you should make one yet? Keep reading…we can convince you. 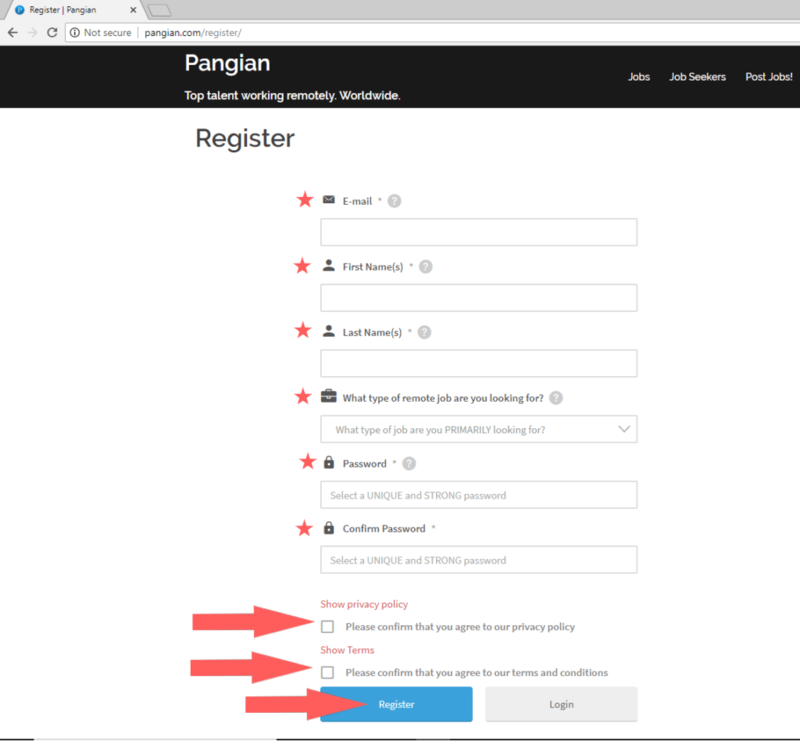 How Do I Create My Pangian Remote Work Account? If you haven’t created your account yet, the first thing you’ll want to do is go here and begin filling out all of the empty fields with your information. Remember to check the boxes at the bottom, and then click the “Register” button when everything is filled out. Congratulations! You’re officially a Pangian. Wait! What if I Already Made My Pangian Account? If you’ve already created your account, great! Sign in and get ready to figure out how having a completely filled out profile can make a difference in your job search. Let’s take a look at my profile to provide an example. You can find me here. 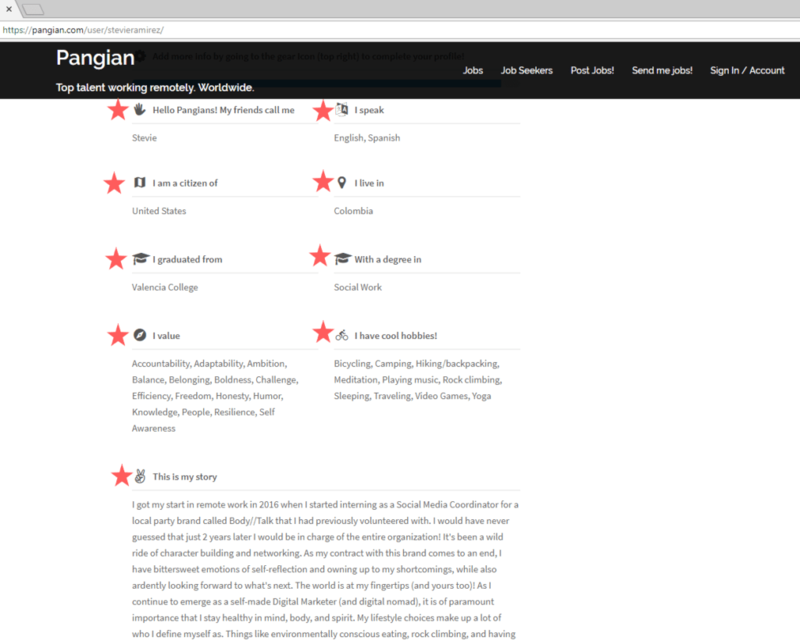 If your Pangian profile doesn’t look like this yet, click the gear button to edit your page. Don’t be afraid to let your personality shine through. 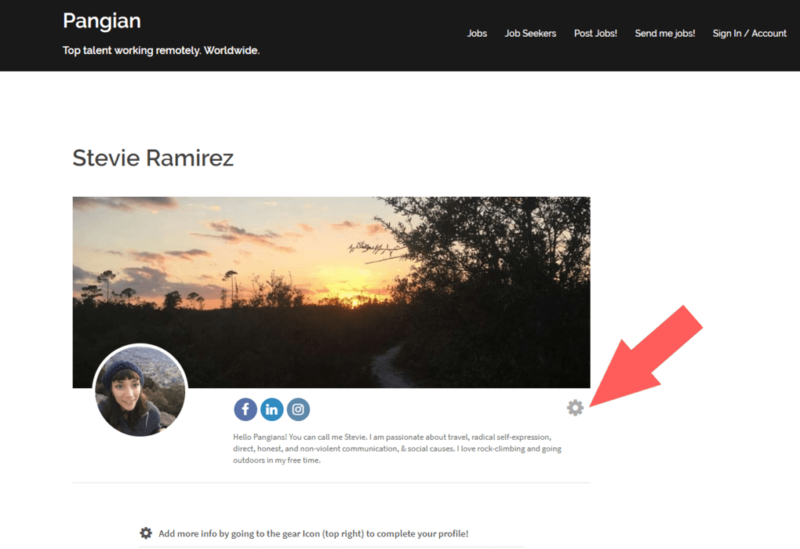 Upload a profile photo so employers and other Pangians can see who they’re talking to. You’d be surprised how much of an advantage it is to have a familiar face when you land that dream job interview! Next up, you’ll want to add a cover photo. Stuck on which photo to use? How about your favorite travel destination? Or your own company’s banner/logo? I chose a photo of a sunset from a hike I took on the Florida Trail. The more customized your profile is, the more you will stand out in the crowd of other job-seeking Pangians– there are 35,000 of us after all! You’ll notice some social media badges below my cover photo. Your future employer or employee will be able to click them and access your social media profiles on demand. I included my Facebook, LinkedIn, and Instagram, but there are even more social media badges that you can include in your own profile. Anyone a youtuber or blogger? We’ll talk about how to add those badges to your Pangian profile in just a few minutes. Now let’s talk about your bio. This is a VERY important space in your profile. You have 220 characters to convince your future employer/employee to continue scrolling through the rest of your Pangian profile. Sell yourself. Say something inspiring. Say something bold. Don’t hold back. Once you complete this first portion of your Pangian profile, you get to reap the benefits of showing up in our members list before other users who haven’t filled anything out or uploaded any photos. Already feels like that 5 minutes of your time was worth it, right? Hooray for extra visibility! How Can I Stay Visible In This Growing Community? Now that you’ve earned your rightful spot in our prioritized list of members, we can get to the meat of your Pangian profile. Let’s take a look at my profile again and see what I have going on. You’ll see 9 stars that indicate which fields in the “meat” section you’ll definitely want to fill out. Did you notice it’s all of them? That’s because they’re all super important! You can start by sharing your preferred name or nickname. I like being called Stevie, so I kept it simple. Next, you’ll want to boast your linguistic excellence by sharing which languages you can speak. Our Pangian global community spans over 57 countries– by sharing which languages you’re fluent in, you gain access to networking with other Pangians you may have otherwise never spoken with! Where are you from and where are you at? Next up is sharing where you were born and where you currently are located. Lots of Pangian employers have time-zone preferences for who they hire, so filling out this little bit of information is a big deal. It might even help you access job openings you didn’t know of yet. You’ll be surprised who will reach out to you just because they know where you’re located. Now we’ll move onto education. If you went to college and earned a degree, it only makes sense to let everyone know. After all, those degrees cost you lots of time and money. Even if your degree is not necessarily relevant to the type of work you’re looking for, it’s always a good idea to show other Pangians that you have the tenacity and discipline to stick through something until completion. Pangians work hard, don’t sell yourself short here. Do My Values & Hobbies Matter? Short answer: YES! We’ve finally gotten to the fun part of customizing your profile! We all have values, hobbies, and a story of how we became who we are today. This is the the whipped cream on top of the milkshake…the really good stuff! Pangian works with lots of intention/culture-centralized companies who are looking for very specific types of candidates that align with their company’s values. That is exactly why we’ve included this section. So if you’re the type of person who wakes up each morning and does a yoga routine, drinks ginger tea, and meditates… or you’re the type of person who goes kickboxing, feeds the homeless, and practices the guitar after work is done for the day, you’ll be doing yourself a favor to include it in your story. How Does My Profile Help Me Get a Remote Job? Glad you asked! At the bottom of your profile is where you put the cherry on top of the whipped cream on top of your milkshake. Starting to make sense yet? There are 7 key components to this part of your profile. Let’s talk about the “hardest” one first– your introduction video. Video. Your personality. Your value. Usually when I find out I have to do something in front of a camera, I get nervous and antsy. You too? Even more reason to rise above the anxiety and upload your video! This is where other Pangians and remote employers get to see you come to life. They’ve already done all this reading about who you are and what you like, so adding your introduction video only makes sense at this point. Who really is the person behind the profile? Leave no mystery to your future employer or employee– let them see for themselves! Keep it short and sweet…even a 1-minute video will serve its purpose. Now that other fellow Pangians can put a face to the name, there’s only one thing left to do: let them know exactly what sort of work you’re seeking out. To do this, you’ll want to list a few skills of yours. Are you a problem solver? Have you managed a team? Did you build your own website from scratch? These are all things employers want to see from candidates. We know because we’ve asked! Choose your most potent skills and put them on display. It’s all starting to come together now! Remote Work – What do you do and how would you like to work? Once you upload your introduction video and list your skills, you can tie everything together by answering a few more concise questions. Choose the fields of work you are job-searching in and whether you are wanting full-time, part-time, contract, or internship positions. It’s that simple! And for those of you who are all about changing your environment every once in awhile, don’t forget to say so under the option for travel job openings! You’re almost done! Now you can breathe a sigh of relief. The last steps before you can hit that blue “Update Profile” button are to add your social media accounts. Remember those badges at the top of my profile I mentioned earlier? This is where they come from. At the very least, I recommend adding your LinkedIn profile so employers and employees can cross reference what they see in your Pangian profile to what they see in your business profile. 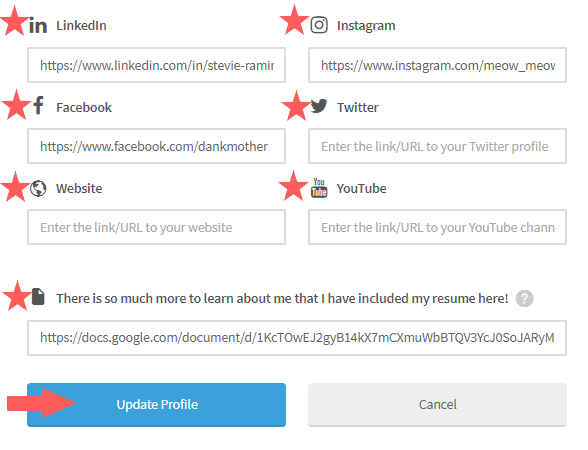 The only thing left before you can be finished with your profile is to share your resume. This is another crucial component to include for cross-referencing purposes. If your resume, LinkedIn, and Pangian profile are all sending the same message, you become even more attractive to employers and other Pangians looking to connect. You just created a highly comprehensive and marketable presentation of who you are as an individual and remote worker. Now go ahead and hit that blue button! Your dream job awaits.